One day in the future, when self-driving cars are the primary means of travel, the roads will be a lot safer. According to plans, cars will communicate with each other and use that information, along with data from its sensors to avoid collisions. On current data alone, that would save around 55,000 lives in the US, every year. Waymo is taking it a step further now, by thinking about how it can protect pedestrians. Even with advanced sensors and high-speed processors, it will be difficult for a self-driving car to avoid a collision with a person. People stumble, fall, slip, or end up in front of a car through carelessness. Any car will not be able to stop in time. Waymo has come up with a solution to minimize the impact on the pedestrian. In a patent filing, Waymo is looking at using car design that uses tension members. These tension members are part of what holds the car together. When the car expects an impact, it will slacken the tension members and reduce the amount of impact the person will feel. At present, the idea is still a patent filing, and we have no idea if it will work. 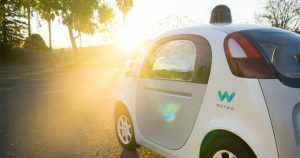 It is encouraging that Waymo is already looking at life after self-driving cars are on the road and the associated risks.